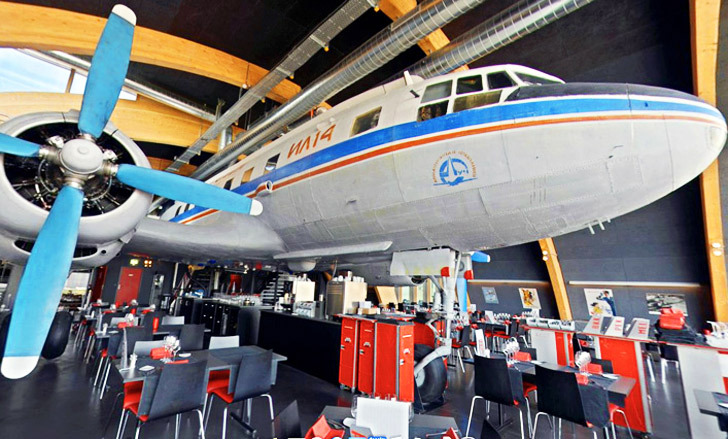 This retired Soviet Iluyshin IL-14 plane has found new life as an incredible restaurant and bar in Zurich, Switzerland. The vintage plane and its hangar, located across from the Zurich International Airport, have been converted into a unique dining experience, called Runway 34. 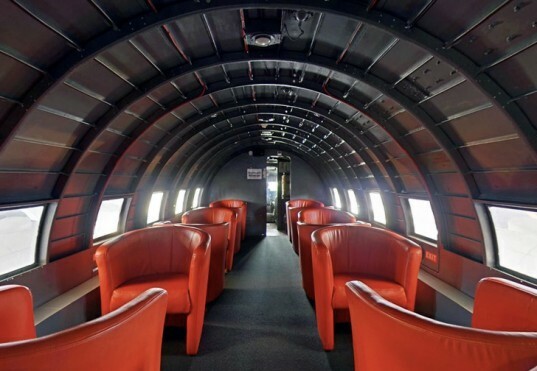 The aviation-themed restaurant offers visitors the opportunity to enjoy meals, stiff cocktails, cappuccino and cigars inside the renovated aircraft and its environs. Runway 34 offers Swiss visitors a unique dining experience that takes place inside, around, and on top of a decommissioned Soviet airplane that has been restored to its former glory. Much of the aircraft and hangar’s effects were kept in-tact — renovations and modifications include the addition of gorgeous wooden flooring, atmospheric lighting, and windows. Each and every detail in Runway 34 is aviation-inspired — from the airplane tail fin menu holders to the in-flight magazine racks. Airline seats can be found throughout the restaurant in addition to deep red leather bucket chairs. The main cabin has been transformed into an elegant cigar lounge that emulates a first class cabin, with cocktail tables arranged around the small airplane windows. To add to the kitsch, servers are dressed as flight attendants as they serve drinks in the narrow aisle. The main eating area is called The Hangar Restaurant. Tables are positioned in front of the plane and under the propellers and engines. The Wingwalker Bar comes complete with repurposed in-flight chairs and offers impressive views through floor-to-ceiling windows. Runway 34 is an innovative and unique experience. The menu of Asian, Swiss and Mediterranean cuisine certainly sounds far better than the average in-flight meal! 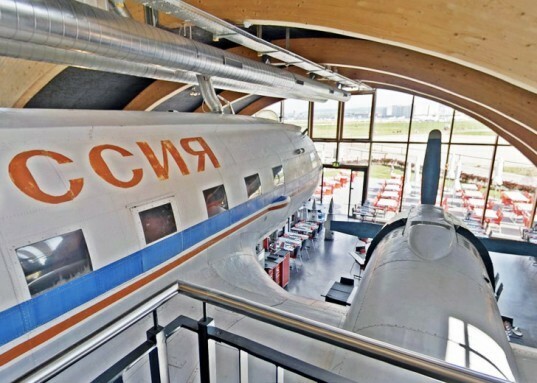 Runway 34 offers Swiss visitors a unique dining experience that takes place inside, around, and on top of a decommissioned Soviet airplane that has been restored to its former glory. Much of the aircraft and hangar’s effects were kept in tact. Renovations and modifications include the addition of gorgeous wooden flooring, atmospheric lighting, and windows. Each and every detail in Runway 34 is aviation-inspired -- from the airplane tail fin menu holders to the in-flight magazine racks. Airline seats can be found throughout the restaurant in addition to deep red leather bucket chairs. The main cabin has been transformed into an elegant cigar lounge that emulates a first class cabin, with cocktail tables arranged around the small airplane windows. To add to the kitsch, servers are dressed as flight attendants as they serve drinks in the narrow aisle. The main eating area is called The Hangar Restaurant. Tables are positioned in front of the plane and under the propellers and engines. The Wingwalker Bar comes complete with repurposed in-flight chairs and offers impressive views through floor-to-ceiling windows.